This week, top officials at the National Institute of Standards and Technology sketched out the agency’s three-pronged strategy for advancing quantum information science. 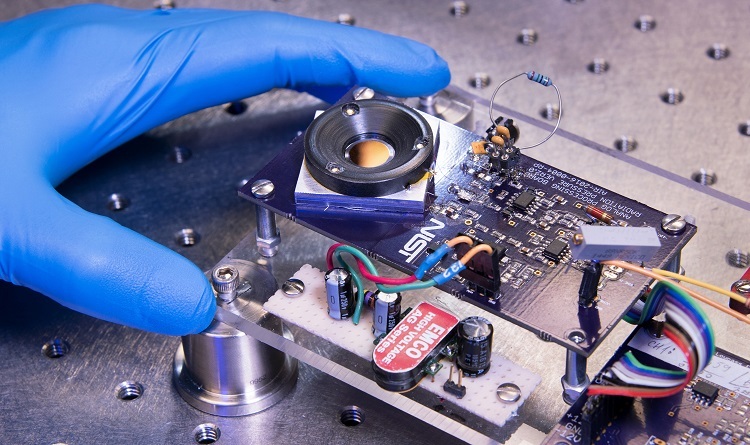 Marquee elements include forming a Quantum Economic Development Consortium and commercializing quantum sensors developed through the “NIST on a Chip” program. The role of the National Institute of Standards and Technology in the emerging U.S. national strategy for quantum information science (QIS) is coming into focus. At an advisory committee meeting on Oct. 16, NIST leaders described initiatives to advance and leverage QIS in the domains of quantum metrology, engineering, and measurement standards dissemination. Among its planned activities, NIST is developing concepts for a new quantum engineering center and is helping form a consortium of companies that will engage in pre-competitive activities to support the emerging quantum technology industry. NIST is also seeking to commercialize a suite of compact QIS-based sensors that do not require periodic calibration — a concept referred to as “NIST on a Chip” that could transform aspects of the agency’s core metrology mission. A prototype compact laser power sensor developed through the NIST on a Chip program. “Many of us would say it’s closer to TRL 1. There are a few places where there’s been some efforts to take things up to a TRL of 4 or so, but mostly it’s very, very preliminary,” he added. Williams said NIST is organizing its activities along three main thrusts: foundational research in quantum metrology, applied R&D in quantum device engineering, and the development of measurement standards based on invariant quantum phenomena — known as Quantum SI. Williams said one element of the engineering thrust could be to create a quantum networking testbed that enables R&D on the transmission and storage of entangled states of light. He referred to the center as a potential “grand challenge” for NIST. The national strategic overview document identifies such challenges as a central organizing principle for federal QIS efforts. Williams noted that NIST could use its campus in Boulder, Colorado, and its nearby joint research institute, JILA, as nodes in such a network. NIST’s campus in Gaithersburg, Maryland, could serve as a node in a separate network built using different technologies, he added. Williams also pointed to the planned formation of a Quantum Economic Development Consortium as contributing to strategy’s engineering pillar. NIST announced on Sept. 28 that it has partnered with SRI International to stand up the consortium. Joe Broz, vice president for strategy and applied sciences at SRI, described the consortium’s rationale and preliminary scope at the meeting. Drawing an analogy with the development of the semiconductor industry, Broz said the emerging quantum industry likewise will require a robust supply chain of “enabling technologies.” A principal function of the consortium is to perform pre-competitive R&D activities that support the development of such technologies, focusing on the TRL range of 3 to 5. It will also assess workforce and infrastructure needs, identify potential grand challenges, and provide collective industry input to guide federal R&D investment priorities, among other activities. Noting the consortium is “primarily by and for U.S. industry,” Broz explained that the member companies will set the terms of how it handles matters such as intellectual property rights and collaboration with universities. Its board will include representatives of three large companies paying the highest membership dues level, two smaller companies, and two federal agencies. Asked if there are competing consortia, Broz replied that several have begun to sprout up near universities such as Caltech and MIT. Currently, NIST periodically calibrates sensors that measure fundamental physical quantities such as time, distance, temperature, and pressure. Often, these sensors must be physically sent to NIST for calibration. NOAC aims to eliminate this step for some types of sensors by producing devices that rely on invariant quantum phenomena to perform measurements. 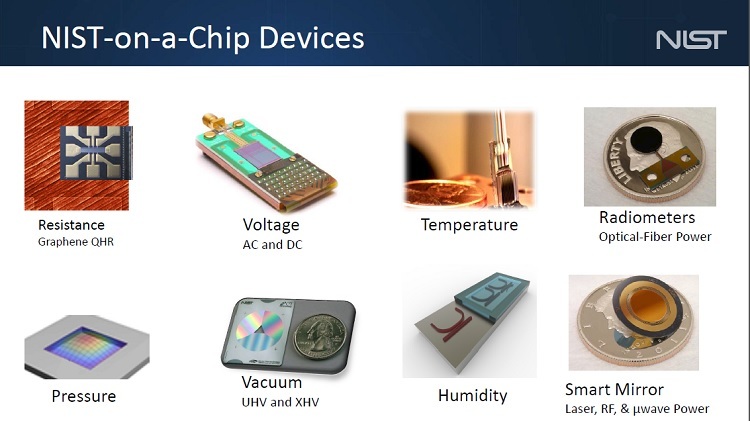 Greg Strouse, associate director of measurement services at NIST, explained to the advisory committee how the agency is currently working on over 20 types of sensor chips. He noted that NIST does not intend to mass produce these sensors, but rather is developing a commercialization roadmap to facilitate adoption of the technology by private industry. James Olthoff, the acting director for laboratory programs at NIST, stressed that NOAC represents a major shift for the agency. One participant in the meeting asked if NOAC could lead to a downsizing of NIST, given that some of its calibration services would no longer be needed. Williams acknowledged that some staff are worried about the potential impacts, but said NOAC would not replace the need for calibration of instruments that measure very small and very large quantities. He pointed to the million-pound deadweight machine that NIST uses to calibrate force transducers as an example of a tool that is unlikely to be made obsolete though chip-scale sensors. Strouse said he expects NOAC will make NIST a “happier place to work” because employees who had previously been burdened with calibration duties would now have more time for research. “NIST won’t get smaller. In some ways it will get bigger,” he said.